Exterior of the Kew Public Library in Walpole Street, originally a cottage next door to the municipal offices. The first library in Kew was that of the Kew Literary and Scientific Society which was opened in August 1860. At the height of its popularity, the library had 8,000 volumes. 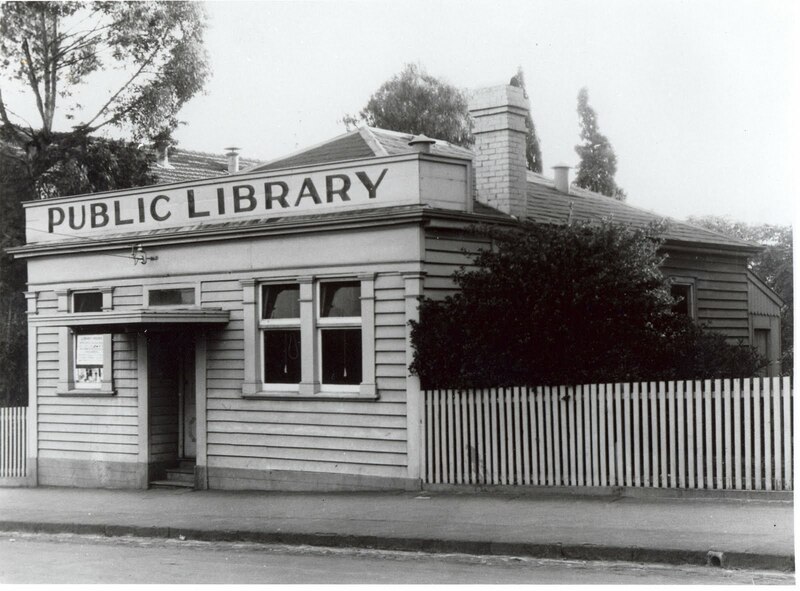 In 1904 a cottage adjoining the Kew Town Hall was purchased for use as a library. Kew Council took over the library, now Kew Public Library, in 1915 and ran it until 1917 when the Kew Traders Association took charge. Finally in 1937 the library was closed, a Library Committee set up by Council and a major overhaul of stock and renovation of the library building undertaken. the bulk of the stock was pulped, new stock was purchased and at this stage the children's section was established. The Library was reopened in December 1937 and from 1947 received State Government funding of £1 for £1 through the Free Libraries Services Board. Kew Councillor and historian, W.D. Vaughan, was for many years a member of this Board and served as chairman. W.D. Vaughan, Kew Councillor and historian. Cr Vaughan was chairman of the Library Committee as well as member of the Free Libraries Service Board of Victoria. "Silence must be observed" states the stern sign over the door in this photograph taken in 1945 of the Children's section of the former Kew Public Library in Walpole Street. Kew Library soon outgrew the cottage and extensions were completed in October 1953. Further extensions and a complete renovation was undertaken the following year with the civic opening on 19 August 1954. These photographs show the exterior of the renovated building and views of various parts of the library. ...and after the 1954 extension and renovation. The interior of the newly renovated library showing the light filled space, the shelves of books, the catalogue drawers and circulation desk, 1954. The Tiny Tots corner of the children's section of the Kew Public Library appears here, in 1954, in pristine condition and without the library bear which has been a feature of the children's section for so long.